In the 8 years I have been an Second Life Resident, only a few months of that time was I not blogging. I didn’t start out Fashion Blogging right away, I actually didn’t know that existed as a thing until I was already in world 4 months, but I was blogging pretty regularly on my own blog. Then I discovered ‘Appearance Mode” I have told this story a few times, and how I had so much inventory from shopping everyday and working, that I started blogging daily. If you think I am wordy now, there are older residents that can attest that how I blog now is barely a blurb by comparison. I loved it, was incredibly passionate about it, and looked at it as a way to contribute to this amazing community. This post is a rant, a big one that has been festering for months. I have spoken about it with Cajsa, and Gidge, as well as Gogo and Whimsy – pretty much daily with Whimsy. As much as I would get my rant on, I never actually wanted to post it. I never thought I would ever do a post about people that blog in a negative at all. Notice that I said ‘People that blog” and not ‘Bloggers” in that sentence. That is pretty much the point of this post. If you have ever really followed me as a Blogger, you will notice that I have been very sporadic in my posts lately. It has been actually really upsetting to me, to realise that many days, even sometimes a week or two have gone past without a post. This is not due to lack of content, I could actually wear a full outfit and delete it everyday for the next few decades – Mel did that math for me last week. It is more to do with being disheartened by what has been happening to blogging in Second Life over the past months, and if not longer. In the past two years, I was getting very irritated seeing plurks and posts with comments from Designers/Creators putting down Bloggers. Outraged really to be honest, at how people that I knew, or had followed as creators for many years, could just dump on us as a whole. To me the idea that one rotten egg meant we all sucked, was vile, and made me very angry. In my working time – I work with a few different stores behind the scenes – I deal with Bloggers almost daily. As well as all the events and other things that pop up during the year. I have also made many lists for stores of their Bloggers, so I do tend to see a lot of what I am going to discuss in this post. In the past year it was getting more and more obvious that there is a wide gap between what I do as a Blogger, what people I have known for many years do as Bloggers, and what is going on now. That is how the word Bloggrrr came about. When working through my mental list of what was the difference between a Blogger and a Bloggrrr, I realised that I needed one more term. So Blogga! was born. So now for the breakdown…and believe me, you will know which category you fall into, because a Blogger knows what they are doing is right, and for the right reasons. As I said, when I started I had a huge inventory. It never even occurred to me that Designers sent items. I knew that stores provided Models for Fashion shows with product, and I knew that Magazines were sent items as well. But blogging was a personal choice, to share information, as that is the point of a blog in the first place, to SHARE. If I came across an item that I knew I would never wear, but just thought it was incredible work and my readers deserved to see it, I would take a pic of the vendor, or even ask the owner of the store for vendor ads, so they were better resolution. If it was skins , I would shoot the demos – no one really gave skins to bloggers back then. But I shopped a lot, and then Designers started to approach me and started sending me things. It was an incredible feeling to have EARNED that. * Start up their blogs because they want to be part of something in their community. For me this was because I could not build, or create items, so I wanted to share what I did a lot of, and that was find and put together looks, as well as sharing information along the way. In posts I often would relay information I had learned somewhere that day, or discovered myself. I often helped New Residents, and also helped customers in the store I managed, so that also carried through to my blogging. I talked a lot, and I find that Bloggers tend to do so, that does not mean you have to talk to be a Blogger. * Have a definite joy in sharing information and content with their readers. They think of their readers, and how what they do effects them. At the end of the day what we say and do on our blogs is looked at with expectations of honesty and in some cases admiration for what we do, and what we know. I have had many conversations with other Bloggers over this in the past, about how it is important to know what we are talking about, and to find out what can help others, as it is us that readers come to for that knowledge. If you go through many of the Bloggers blogs, you will find tutorials on hundreds of things that help readers/community almost daily. I have pasted the link to my Alpha tutorial many times in in-world groups when someone has needed it. I have pasted links to other Bloggers tutorials as well, and also seen the links flow all over the grid. * Showing support for other Bloggers, whether through in world groups, plurk or other means. In the past, Bloggers have often collaborated on posts together, shared information from one post to another, sharing pictures, and crediting on both blogs. Some people that I have made stand on a posestand with me, went on to become Bloggers themselves. Memes, and Blogger Community focused Challenges, all combine the spirit that has always been very big in the community. Sometimes it can even bring Bloggers out of retirement, wanting to be involved in a community driven project such as that. * Purchase items as they are needed to start out, and if on a limited budget, find ways to still share information. This can be by either starting a blog focusing on free content, group gifts, promotional and discounted items. I actually applaud those bloggers, because generally they work very hard to do posts as much as possible, with limited content, but do so to help people with limited income, or New residents. It takes as much time and energy to blog a 500L item as it does to blog a free one in many cases. * Building honest relationships with Designers/Creators, over time, and caring about their content…such as letting a Designer know if there are errors in packaging, sizing, fit, and any feedback that may be helpful. This can lead to many years of good relations with Designers, and sometimes even testing an item before release or being asked for opinions on many different things. * They CREDIT ALL…there is no such thing as a Blog “Sponsor” unless that “Sponsor” pays for your website and/or domain, or it is actually a store blog, and you are using their items in posts and adding information about other items along with them.I have actually done that in the past…when I had a break after Appearance Mode, I worked on the store blog for the store I managed, and posted looks of the day etc. That is the only time Sponsorship in Second Life Fashion Blogging actually means anything. * Someone whose main blogging purpose is to share information of ALL kinds. This does not just mean by crediting. As I said earlier, I had to make up this term to fit this title. The Bloggers that come to mind in this title are Gorgeous Yongho, Strawberry Singh, Chic Aeon, Iris Ophelia and so on. I also am a Blogga! on occasion. To me this title does not mean they are any less a Blogger fashion or otherwise, it just means that there are times that even if fully clothed and on location or in a studio, it is NOT the fashion that they are communicating. The post is about a featured aspect of the scene, or it is a completely different item/s. An example of a Blogga Blog would definitely be SeraphimSL, as they are all about sharing information that helps, readers and the event organisers and creators share vital information. * Tutorials are really important, sharing information that can help educate their readers/community. This is also not just a post on how a product works or to benefit a particular store, this is to do with technology within viewers, products that help in the day to day use of Second Life. Tips and tricks to create or just to exist within the community in a better and sometimes prettier way. * Blogger Community Focused, in ways that go further than just their own blogs. This is things like Bloggers Groups, Blogger websites, running Blogger events, memes,challenges, and creating spirit within that community, and often giving an opening to Designers/Creators that may be unsure on how to interact with Bloggers they don’t know. It may seem harsh as a description, but it has become more and more justified in the past 8 months. * A person that starts a blog because they think it is a way to get all the things they want to wear in their day to day, but not actually spend any lindens. Blogging in SL is not a Hack, you don’t win or get to the top level faster because you didn’t pay to play. I am on many Bloggers lists, Groups, etc, I get sent items which I do not always have time to blog, or may in some cases not be my style or may not fit etc. This does not mean I have ever stopped spending money on things I need to. If a creator sends me items that is wonderful, If I send a creator a note-card and ask for items and am not sent them, then I purchase them, but that is only if I want to blog them that I contact them at all. If it is because I want to own them I buy them. Blogging should not be a shortcut to amassing inventory. * A person that contacts a Designer/Creator every day with a note-card that can sometimes even be addressed to the wrong avatar, and has an entitled expectation of getting what they have asked for. Within a 24 hour period, they can contact the Designer/Creator or even Manager, more than once, to ‘follow up’ on their request. If not answered, and items are not sent, they continue to send notecards or IMs. This can actually go on for weeks, and sometimes leads to the Bloggrrr being muted or in worse cases, actually sent the items so that the Designer gets some peace. A Bloggrrr should never put anyone in this position, you have not earned anything if you get items in the end, you have been a bully. * IM Designers/Creators with Hi, Hello, you there, or even straight to the point of ‘ Send me new items” Often in these IMs and sometimes notecards there is illegible speech used, by this I do not mean the difference of English as a second language/translator needed…I mean U and Da used to cover You and The. If you are interacting with a person in Second Life that is not your friend, leave the crazy talk somewhere else. * The blog has music included, this is actually one of the funniest things to ever have to say to someone is just bad. Music is often personal taste, your choice of content may not be the type of music that is liked by your readers or in some cases even appropriate content…with songs that may have racial slurs or vulgar language used – do not misunderstand, I swear like no ones business, but I find swearing in text on blogs or in music offensive if not something I myself have chosen to listen to. If you want to create an atmosphere on your blog, and feel that music does that, then make that music an option. Do not have it set to Autoplay, and make sure that all controls of that music are clear and at the top of the blog. Opening a blog to check it or read it for whatever reason, and having your eardrums blown out means you can lose readers, who will never enjoy your content. * A Bloggrrr does not credit all items. I often see people asking in in world groups as to where an item is from. Often I expect to see a link to a MP Listing, or perhaps a print screen of a vendor ad. But when it ends up being a blog post link, I get very disappointed. There is no reason ever other than the three free passes I gave earlier, that you should not credit an item. I have heard so many excuses for this that it is such a bizarre thing. I have been told there is no reason to credit something behind someone if its not fully shown, such as a bag may be peeking around behind someones legs, but apparently there is no reason to credit that. The ugliest excuse is ‘ I bought them” what the hell does that even mean. You purchased the items, so that means sharing that information with your readers is not necessary? WHAT ? You are not doing a fashion post, you are taking a picture after you got dressed. If you think you are a Blogger and you call your blog a Fashion Blog then you need to credit all Items. ” I only credit my Sponsors” , ” It is not fair to credit stores I bought from, when others give to me” , ” I only blog what I am given” that last one was something told to me one day, and started the whole Bloggrrr mind blowing anger that erupted into this post. Also ‘ I have worn the items before so I don’t credit again” A readership can grow every day, someone can be visiting your blog for the very first time right now, and everything in your most recent post may be completely new to them. They may even be new to Second Life, if you do not provide the information in every single post, then you have let down not only that reader, but your whole blog, and definitely the Designers and Creators. It is also not about Sponsors vs Purchased, it should not be ever the case, because there are NO SPONSORS. Bloggrrrs made that up themselves, it is not something that was ever in a Second Life Blogger vocabulary, and Bloggers I know cringe every time we see it. Lets take away the fact that you don’t actually have any, you are just on some lists, and sometimes you are sent things from other stores, this does not bind anyone to any contract – that is a whole other rant – but this is also very telling of Bloggrrrs not knowing, or caring about what they are doing. You are not allowed to advertise with banners/images, on free wordpress sites, as in using your sidebar to link to stores and so on with graphics such as the logos of stores. Those ‘Sponsors” you all seem to be collecting like Pokemon, could cause you to lose all of your content, with wordpress taking you down. Self-hosted blogs are allowed to do so, because they pay money for the option. If you only blog/credit content given to you, then eventually your followers will look at your blog as an advert, not a fashion resource. It will mean you’re paid to blog, but not even paid in what would be value for your time. If everything you are wearing is just the same pack as everyone else got, then readers will go elsewhere, there are enough blogs on enough feeds to replace you. When crediting items, be sure to actually name the store properly, copy pasting from the abbreviated wording on the items in inventory does not help anyone. Hair by dvb doesn’t mean anything to anyone unless the store is actually called dvb. Don’t be lazy, and make sure you know what you are blogging. * Taking time to learn how to do things that are part of a bloggers must know tools of the trade. If you cannot tint your feet, hands, bottom, mouth, ears etc go away and learn how to do so, it is readers that rely on you to know how to do that. If your pictures show your feet in a different tone than your legs DELETE the picture. If a necklace is hovering above your shoulders and your hair is cutting out the window behind you in a picture DELETE THE PICTURE. There is never an excuse for sloppy pictures like that, there is a duty of care for all items shown to your readers. If mesh doesn’t fit you, and there is a huge gaping hole around your waist, do not blog that item, if it doesn’t fit you , either edit your shape for it to do so , or move along. You are not helping anyone making yourself and the items a joke. * Blogging for a store blog, but expecting items be sent to you from other stores. A store blog is a promotion tool for that store. Them deciding to hire you in some way to do looks of the day and so on using their own items as part of every post is a very different thing than your own fashion blog. If you work for a store, then it should be the responsibility of the store to provide you with some kind of way to purchase the other items needed…you should not be used for your inventory or items gathering skills, because while the other store is being credited, it is still a store blog. * Event blogging and getting into an event earlier than others is great. But if you apply for an event or miss the deadline on applying for an event, do not boycott the event. That shows you to be caring more about yourself than your readers, and anything that event has to stand for. Every single sim in Sl has a limit of how many people can be on that sim, even if there is a preview, it is not possible to add every single blogger to that list. But it should never ever mean that you wont blog it, it should also never mean that you don’t attend, or not even mention it on your blog.Your readers deserve to know what is happening and you may be their number one resource for news, if you do not even mention the event, that means they miss it, and when they find out it was on, they are not going to be happy you let them down. This is not to say that you should be promoting every single thing on the grid, but there is a difference when you actually say to someone or people that you are not going because you didn’t get your way, that is just ugly. It is also letting down all the creators participating in the event that may have supported you over the years. * Using your blog as a weapon. This makes me very angry, and even if you are a Blogger, if you do this you get slapped right down to Bloggrrr status. DO NOT EVER threaten anyone with your blog. This is not about doing a blog post where you have an opinion, or do an honest review of an item, that may or may not be favorable. This is about taking personal situations and using your blog to perform for the masses in some way. This also counts with Flickr and the like, your readers, and followers are not your audience for vile behavior. You let down not only them, as well as the Designers who support you in some way, but you also let down yourself. * Blogging obviously stolen copyright infringing items. It does not take a rocket scientist to know that NO ONE in Second Life has the license to create Chanel, Barbie, Hello Kitty, Versace labeled items. Just because you are sent a pack of tshirts or dresses that have a Chanel logo on them, does not mean you have to blog them. No amount of content sent to you from a store, is ever worth what your integrity is worth. If Bloggrrrs stopped blogging this garbage, then people that have shops that sell it, may just stop creating it, if their advertising for it dries up. It is because you look so good mixing and matching it, and give it some kind of approval, that the spiral continues. Copyright in Second Life is just like RL…you know that buying a knock off for ten bucks on the side of the road does not give your look any value at all. So exactly what does wearing something worth approximately 73c that is copyright infringing do for you ? You look like a tool, and you lose the respect that anyone with any understanding of this may have for your work. Those that sell it are also completely ignorant of the overall wants of their customers, those maybe hundred of a stolen item you sell, may cost you many more sales when conscientious customers walk out the door when they see a Superman tshirt. On a side note, I actually think that Designers/Creators that provide content to Bloggrrrs that do blog this kind of product should stop sending them items. You sending them items shows support for not only their blog, but also the content they show on it. What it all boils down to, is that regardless of how incredible your photography is, how amazing your style choices are, when you blog in a way that shows no consideration for anyone, you aren’t a Blogger you are just someone throwing some glamour shots up on a website, and if you want to be a photo-blogger, then go right ahead, do exactly that, just take pics and post them, no credits, nothing…but do so for arts sake, because you enjoy it as a hobby, don’t spend most of your day running around to every store and event and expect them all to give you stuff. Some stores will send to photographers, because they do want to see their creations shown in a beautiful way…but that is a mutual understanding that it is not about credit, or advertising, it is about expression. I could probably keep writing for days on this subject, but I will stop there, because I finally got to release some of the build up from my mind on this topic. 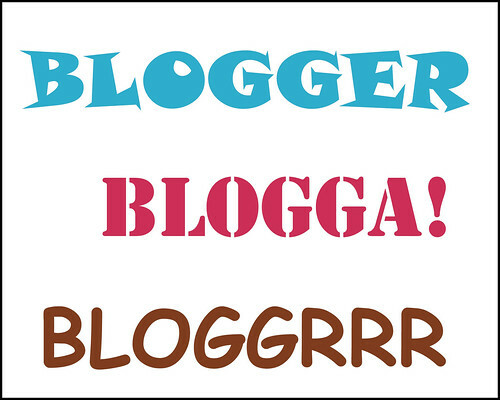 Bloggers and Blogga!s’ you are an asset to our community, you are the go between from Designer/Creator to Reader and Community, your work is appreciated, and I applaud your dedication and energy. Thank you for letting me be a part of what you all do.